That all EVMs in 2019 will be VVPAT enabled is a good step although more needs to be done to secure the EVMs. VVPAT enabled EVMs for 2019. A lookback at hacking of EVMs. Will India’s Election Commission admit that its hitherto – ‘unhackable’ Electronic Voting Machines [EVMs] have given way to the Voter Verifiable Paper Audit Trail [VVPAT] solution to end rigged elections due to a foul play noticed way back in 2009 in Tamil Nadu? The Congress which alleged rigging of the elections has a somewhat dubious record in the matter – and it concerns its blue-eyed-boy – P Chidambaram. After insisting that its EVMs are hack-proof till April 14 2017, India’s Election Commission suddenly demanded Rs.3,174 crores’ [US$ 48 million] to fund purchase of 16,15,000 VVPAT machines to cover all polling stations. The Union Cabinet chaired by Prime Minister Narendra Damodardas Modi granted it after a brief discussion despite the absence of Law Minister Ravi Shankar Prasad, agency reports said. Is there more than what meets the eye to this? Heading a group of 16 political parties, the Congress had petitioned the EC to revert to paper ballot system for greater transparency, another report added. A judgement pronounced by a Division Bench of the Supreme Court comprising Sathasivam and Ranjan Gogoi on October 8 2013 – that actually had forced the hand of the government – for reasons best known to the National Mainstream Media [NMS] – remained hidden. “From the materials placed by both the sides, we are satisfied that the “paper trail” is an indispensable requirement of free and fair elections. The confidence of the voters in the EVMs can be achieved only with the introduction of the “paper trail”. EVMs with VVPAT system ensure the accuracy of the voting system. With an intent to have fullest transparency in the system and to restore the confidence of the voters, it is necessary to set up EVMs with VVPAT system because vote is nothing but an act of expression which has immense importance in democratic system,” the judges said. The appellant in the matter was Dr Subramanian Swamy. “We record our appreciation for the efforts made by Dr. Subramanian Swamy as well as the ECI, in particular Mr. Ashok Desai and Ms. Meenakshi Arora, learned senior counsel for the ECI,” the bench observed in paragraph 32, page 18. Narendra Modi ripped into P. Chidambaram at a public meeting in the Union finance minister’s home state calling him recount minister. The taunt “recount minister” was an allusion to Chidambaram’s 2009 victory from Sivaganga by a narrow margin after a recount. The election of P. Chidambaram from the Sivaganga Lok Sabha constituency in the 2009 general election was contentious and controversial for more than one reason. Late in the night of May 16, 2009, Chidambaram was declared winner by a margin of 3,354 votes after 21 rounds of counting. Well before the official declaration of the results, television channels and a news agency had reported that the Union Home Minister had lost. The AIADMK candidate, R.S. Raja Kannappan actually went to the room of the Returning Officer to receive his election certificate, only to be told that the counting had not officially ended. The ally of Chidambaram’s Congress, the Dravida Munnetra Kazhagam, was in power in Tamil Nadu at the time, leading to speculation that the counting process was subverted. “We cannot accept the verdict of [the January 2009] Tirumangalam by-election because 30 percent of the votes were cast during the last one hour through electronic voting machines (EVMs). The recorded votes are doubtful and we suspect rigging by the minority DMK government,” Jayalalithaa said. Noting that due to the possibilities of tampering with EVMs, advanced nations like US and Japan have returned to paper ballots, she said explanations sought from the Election Commission regarding the anomalies in the voting patterns in Tirumangalam and the efficacy of EVMs has elicited no response. In all 380 EVMs were used during the Tirumangalam by polls, according official reports of Naresh Gupta, the Chief Electoral Officer, TN at that point in time. DMK winner polled 43,155 votes; the nearest loser AIADMK bagged 21,598 and the DMDK got 4,155 votes. The results indicated that at least 34 persons ought to have voted on each EVM during the last one hour, which was practically impossible. Will the Congress – one of the parties that demanded paper trails to EVMs reveal as to how its ally had achieved the impossible in Tirumangalam in 2008 December and later in May 2009 at Sivaganga? And the original query again: Will India’s Election Commission admit that its hitherto – ‘unhackable’ Electronic Voting Machines [EVMs] have given way to the Voter Verifiable Paper Audit Trail [VVPAT] solution to end rigged elections due to a foul play noticed way back in 2008 and in 2009 in Tamil Nadu? 1. The conversion rate used in this article is 1 USD = 64.61 Rupees. A veteran writer, T S V Hari's opinions and essays have been carried by many newspapers, periodicals and websites. A regular contributor to Thuglak magazine under he pseudonymn Venkat, his by-line was recently spotted in the Tamil periodical Kalki. 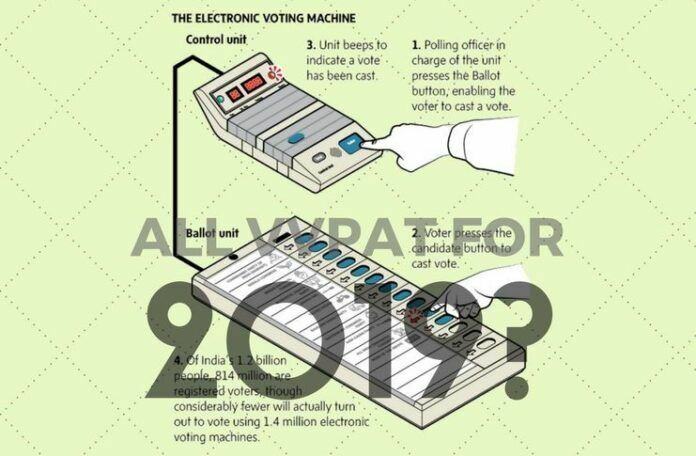 Let’s understand the simple method of operating the EVM, its relevant to old age school project of match the following. tampering would mean that anybody voting for main political openant the connections goes to ruling party or vice versa, isn’t this possible ? Let’s say UP election those voting for SP end up voting for BJP .. so all votes meant to SP goes to BJP ..in that case a single voting machine hasn’t registered a single vote to their main opponent SP ! I think we need to make a difference between hackability of the EVM and the additional possibility of audit trail with VVPAT. All I’m saying is, VVPAT is as much hackable as the older EVM, but if it is hacked, in the case of VVPAT, if the EC orders a recount of the paper trail, the fact of hacking will be exposed, whereas without VVPAT, this exposure of hacking is not possible. So, I think EC still believes both the old EVM and the VVPAT are not hackable, and they want to assure the voters that the system is completely foolproof (unless the system is subverted here and there in a few places – even this is my caveat, not EC’s), by introducing VVPAT. To paint the EC in bad light as if they are covering up for their mistake is grossly unfair to the EC, to say the least.